Pizza, pretzel, and strudel are all Old World European specialties that involve “pulling” dough. Join Martha in the kitchen to learn all the expert tips you’ll need to prepare these recipes at home: old Vienna apple strudel with cookbook author Nick Malgieri, pizza with Fortina’s Christian Petroni, and soft pretzels with Sigmunds’s Lina Kulchinsky. How to maintain a smooth glossy pretzel surface by starting with a long piece of dough. This soft pretzel recipe for homemade chewy pretzels comes from Sigmund Pretzelshop owner Lina Kulchinsky. It appears in the Pull Doughs episode of Martha Bakes. In a medium bowl, mix together 2 cups warm water, yeast, and 1/2 cup brown sugar; let stand until foamy, 5 to 10 minutes. In the bowl of an electric mixer, mix together flour and coarse salt using your hands. Add butter and continue to mix with your hands until mixture is crumbly. Add yeast mixture and, using your hands, mix until a shaggy dough is formed and water is absorbed. Using the dough hook attachment, mix dough on medium speed until dough is tight, elastic, and smooth, 6 to 8 minutes. Cover with plastic wrap and transfer to refrigerator; let chill at least 8 hours and up to overnight. Roll dough out into a 14-by-12-inch rectangle. Cut dough into one dozen 12-inch-long strips, each about 1-inch wide. Working with one piece of dough at a time, roll out each piece into a 30- to 33-inch-long rope (about 3/4-inch thick), starting from the center and working toward the ends. Make a "U" shape with the rope and cross the ends over, pinching at the bottom of the "U" to form a pretzel. Return to baking sheet and repeat process with remaining dough. Spray a large baking sheet with nonstick cooking spray. In a large saucepan, combine 8 cups water, baking soda, beer, and remaining 1/4 cup brown sugar; bring to a simmer over medium-high heat. Simmer pretzels, one at a time, about 30 seconds, holding them under the surface of the water, if necessary, using a spider or slotted spatula. Transfer to prepared baking sheet and repeat process with remaining pretzels. 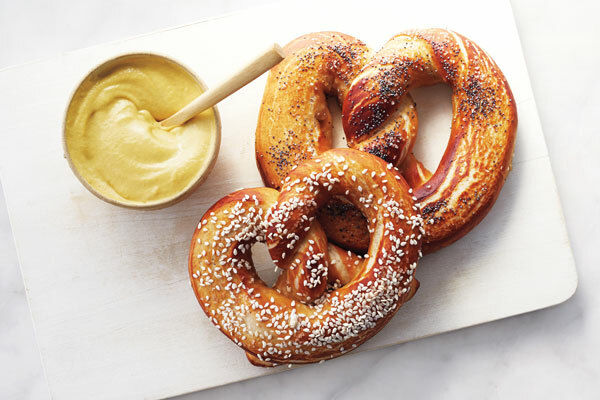 Sprinkle pretzels with pretzel salt and desired toppings; transfer to oven and bake for 5 minutes. Rotate baking sheet, and bake until deep brown, 4 to 6 minutes more. Remove from baking sheet and transfer to a wire rack to cool slightly. Serve warm with butter or mustard.